Johann Gutenberg (c.1398-1468), German printer and pioneer in the use of movable type, is generally regarded as the first European to print with hand-set type cast in molds. The modern printing process, which he delveloped, caused a revolution in the education of the public, who previously had little, if any, access to the few books that existed at the time. Around 1450, Gutenberg set up a press in Mainz (where he was likely born) on which he probably started printing the large Latin Bible associated with his name, as well as some smaller books and leaflets. The Bible, known variously as the Gutenberg Bible, Mazarin Bible, or 42-Line Bible, was likely finished by the end of 1456. Gutenberg was later forced to give up his press and types to pay off a debt. Detailed records of Gutenberg’s life and work are scant. 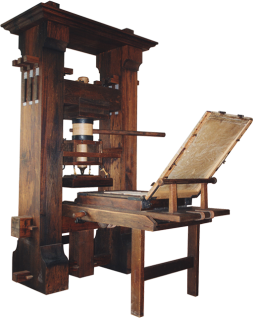 The press pictured is in fact an interpretation of Gutenberg’s printing press; no one knows exactly what the original looked like since Gutenberg took great pains to keep his revolutionary new press a secret. The Gutenberg pictured is a full-sized, working press built by Steve Pratt of Pratt Wagon and Press Works. Steve’s replicas, each of extraordinary detail and craftsmanship, include an iron, 1400-pound Smith. The Gutenberg, one of the latest to come out of Pratt Wagon and Press Works, is housed at the Crandall Historic Printing Museum in Utah.